All eyeshadows have a wonderfully smooth texture! They're not the most pigmented shadows MAC has, but I guess these shadows are meant to have a "softer" look to them. I've finally swiped a sample of the ProLongWear foundie, yay! I've also swatched Full Speed Ahead lipglass, it is soooo pretty!! ^.^ The MAC Me Over collection was kinda, meh for me heh heh. 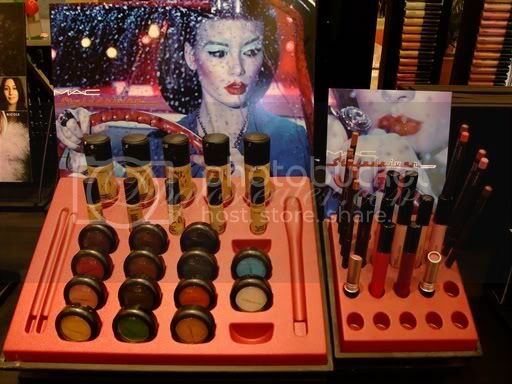 I went to the Mac website and couldn't find anything regarding this collection under the "what's new" section, I even searched for some of the eyeshadows and they aren't online yet, do you know the official release date in the US? Heh heh, methinks my heart is no longer faint. I love pinks!! wow this collection has a lot! i may get Pink Frontier just 'cause i don't believe i've seen (and haven't owned) a golden pink eyeshadow yet. Hot Paprika looks promising too! btw first time commenter her but i love your FOTDs especially eye makeup - gradient blending, brilliant! Sadly not yet. I need the moolah for new headphones. >.< Are they permanent?